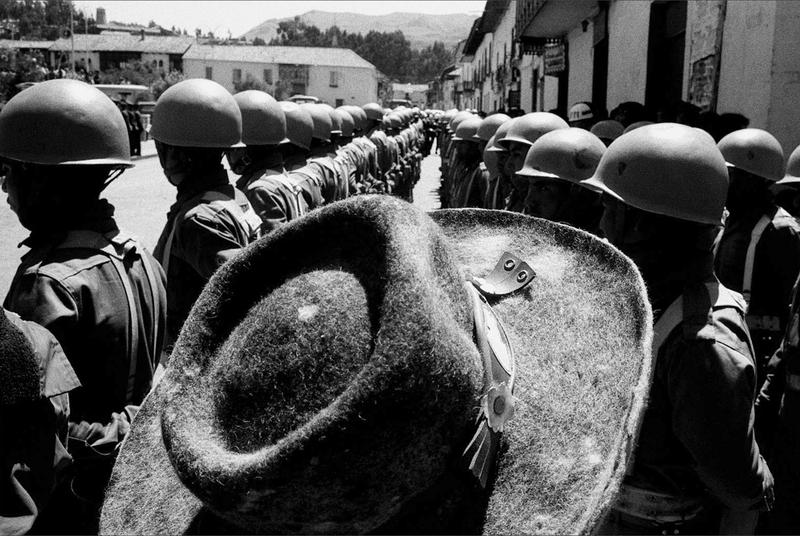 PERU - In the 1980s the Shining Path (Sendero Luminoso) was upending the daily life of rural Peru. I was on assignment in the Cusco region during this period, sent with a group to document valuable artwork in remote convents and monasteries to prevent theft. Even though the Urubamba valley was stable there were often military gatherings in the main square of Cusco to put on a show of strength. The scene depicted here is enhanced by the presence of the hat in the center, which strengthens the composition while at the same time juxtaposing the local inhabitant with the often-ineffectual government forces. One wonders what this man was thinking at the time – who was friend and who was foe.